So after a long run of First Street bars, I figured it was time to hit up another midtown bar, so Eighth Street Tavern was an easy (actually Tavern) choice for me. Coincidentally the bar is located on the corner of Washington and Eighth Street, and is easily distinguished by the large green awning over the front and side entrances. 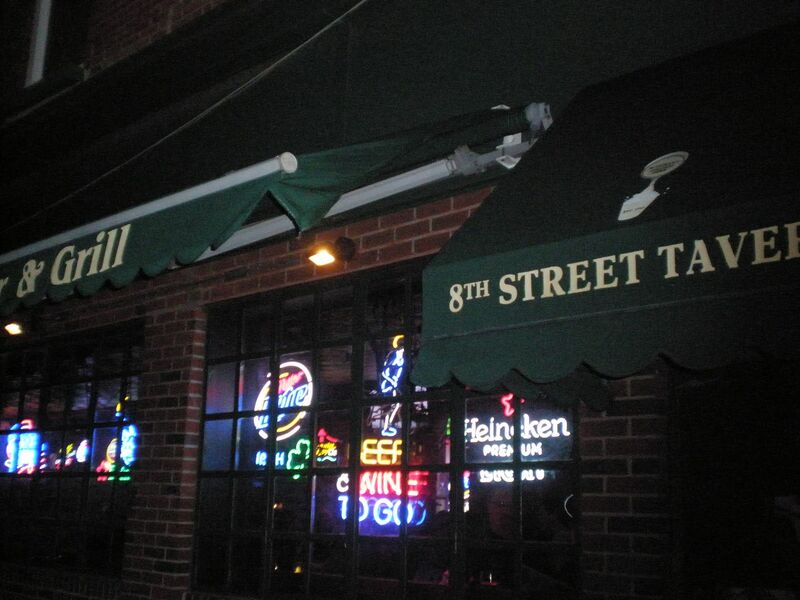 Eighth Street Tavern is one of those places that everyone will feel comfortable in. No doubt about it- it’s a dive. Although the beers are cheap, the mixed drinks are actually small in size, but the bartenders are always ready to serve you more. I had been to Eighth Street Tavern a few times before and usually for a night cap after a dinner out, when it normally is pretty empty. Much to my surprise on the Saturday night that I walked into the bar, there was a pretty good crowd already there. Nearly all of the seats around the really large island bar were taken. We found a couple of seats as far away from the door as possible and near the bathroom (that’s actually hidden behind some old western swinging doors). There were a few tables for four set along the outside walls of the bar, ready for people to have some dinner…but with all of the great restaurants in Hoboken, I don’t think they get that big of a draw. 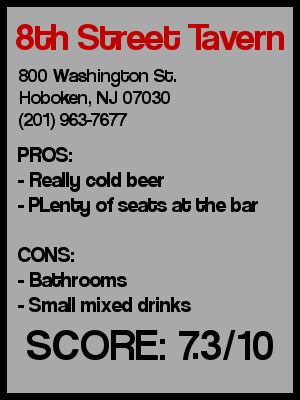 For a dive bar right near the Stevens campus, there seemed to be little to no Stevens students inside which was surprising. In fact I can’t remember seeing any Stevens’ students there during any of my visits to the bar. I have heard that the bar seems to purposely go out of their way not to be too welcoming to Stevens students, but I don’t know that for sure. 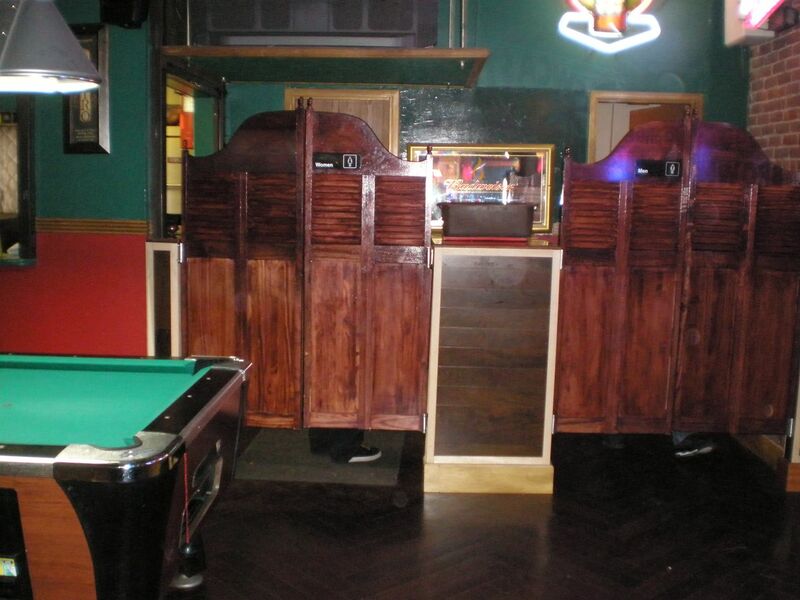 What I did notice is that a lot of the crowd was waaaay too dressed up for this dive bar. The reasoning was that they were grabbing a few drinks here while they waited for their table at Margarita’s, the Italian restaurant across the street. Margarita’s is a tiny but very good BYOB restaurant that doesn’t take reservations. Therefore when you want to eat there you end up having to wait. They give you one of those buzzers and tell you to head across the street to Eighth Street Tavern. So that works out real well for Eighth Street as they get a nice “captured” crowd. The Eighth Street Tavern has televisions up on all of the walls, including one of those ancient huge non HD TVs with the stand built-in, which you last saw in your friends’ basement in 1996. I think it’s too heavy to move from its perch above the bathroom so it will likely stay there until it dies. The rest of the TVs were showing a whole bunch of sporting events. I got a couple of beers and my date got a couple of vodka sodas. The beers were super frosty, something that Eighth Street Tavern takes very seriously, as their awning promises the coldest beers in Hoboken. The mixed drinks were kind of small, but the price wasn’t too steep, which is helpful as this bar is cash only. 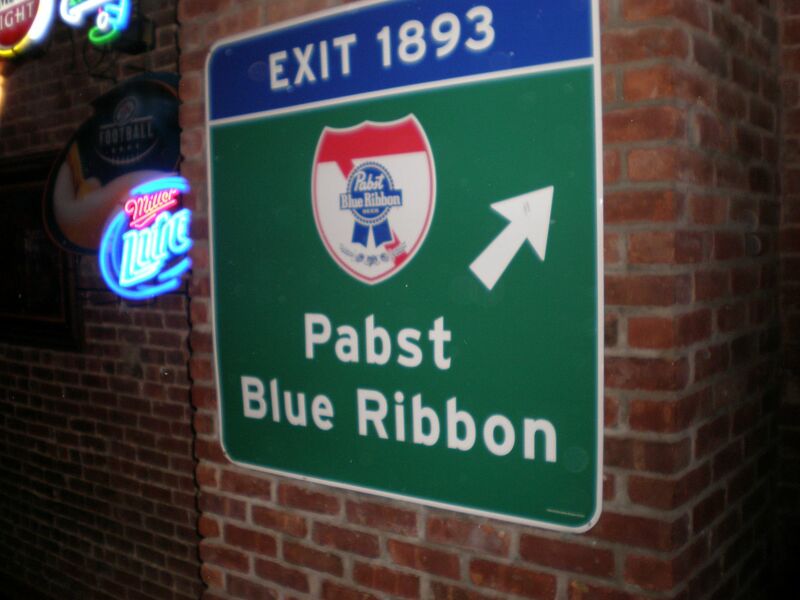 Preconceived notion – I’ve only gone to this place for a last drink and it’s always been empty with an older crowd. I felt it was going to be empty again for this visit. Value – Didn’t have any specials while I was there, but it was pretty cheap. First or last drink of the night – I’ve been there for first drinks and last drinks, but really nothing in between. Overall – This place surprised me. I thought it would be empty like most of the other times I was there. However there was a pretty good lively crowd. Of course some of that crowd was there because they were waiting for a table at Margarita’s, but I’ll give them some credit. This place does have plenty of seating, and I never felt awkward walking in, as opposed to some of the other dives I’ve been in. I’ll give it a 7.3.